This trek is an unexplored journey of the northern Annapurna region. It is completely isolated valley. People are amazing and they have their own unique culture and tradition. 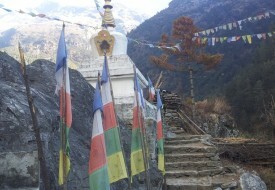 This trek starts from Koto Manang, the main trekking trail to Annapurna Trek. Passing through this Trans-Himalayan zone provides an opportunity to experience unique Buddhist culture. Popular monasteries are found along the beaten path trail to Nar Phu valley. Ancient Tibetan village, hidden mountain valley and high altitude settlement can be observed in this trek. Kangla pass (5,306 m.) with panorama of Annapurna 2nd (7,937 m.) Annapurna 3rd (7,555 m.), Annapurna 4th (7,525 m.), Gangapurna (7,454 m.) Tilicho Peak (7,134 m.) and Pisang Peak (6,091 m.) can be viewed on the way. Other many Mountains can be viewed from the pass. After the pass, Manang valley is reached from where continuous journey leads to the Throng la Pass (5,416 m.). Another option is turning to Chame (2,670 m.) to get back to Beshar and Kathmandu. The trek start from Koto Manang, through the Hidden Mountain valley. Day 09: Trek to Nar Phedi (3820m) 6 hrs stay overnight in Gompa Monastery. Day 12: Trek to Ngawal along the high pass of Kang La Pass (5130m) stay overnight at lodge 8/9hrs. Day 14: Drive to Besisahar by local jeep takes time (5 hrs) then over night at Besi sahar. Day16: Drive to International Airport and Departure.